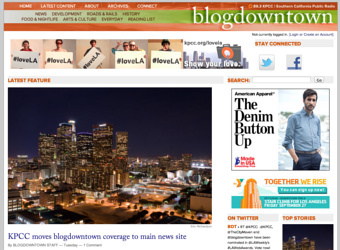 The blogdowntown home page on the week that KPCC announced they will be shutting down the site, which I started in 2005. In the end, the question I couldn't answer was the same one that has been haunting journalism for years: how do you make money on this? As Kevin Roderick noted at LA Observed, we went through several models over the years. We tried the non-profit thing, but discovered that local businesses really don't care about a tax write-off—they care about whether you can bring people to their door. The print edition was by far the biggest shot at making a financial model, and I believe that it is one that could have succeeded given a little more runway and a little more business savvy. That's the biggest lesson I took away from my time as an attempted entrepreneur: I can't do everything, at least not all at once. If I were doing it all over again I would have made sure to find a partner who could have lived and breathed the numbers side in the same way that I did the content side. When I was having to wear both hats, too often it was the money side of things that got put off in favor of the content and the product, and that's clearly not sustainable.